Thanks to the author, I have a paperback edition of Dance Lessons to giveaway. Just enter via rafflecopter link at the bottom of the page. Good Luck! A year after her husband’s death in a sailing accident off Martha’s Vineyard, Ellen Boisvert bumps into an old friend. In this chance encounter, she discovers that her immigrant husband of almost fifteen years was not an orphan after all. Instead, his aged mother Jo is alive and residing on the family’s isolated farm in the west of Ireland. Faced with news of her mother-in-law incarnate, the thirty-nine-year-old American prep school teacher decides to travel to Ireland to investigate the truth about her husband Fintan and why he kept his family’s existence a secret for so many years. Between Jo’s hilltop farm and the lakeside village of Gowna, Ellen begins to uncover the mysteries of her Irish husband’s past and the cruelties and isolation of his rural childhood. Ellen also stumbles upon Fintan’s long-ago romance with a local village woman, with whom he had a daughter, Cat. Cat is now fourteen and living with her mother in London. As Ellen reconciles her troubled relationship with Fintan, she discovers a way to heal the wounds of the past. 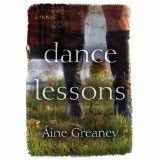 Deeply rooted in the Irish landscape and sensibility, Dance Lessons is a powerful story of loss, regret, and transformation. Born and raised in County Mayo, Áine Greaney is a writer and editor living on Boston’s North Shore. She is the author of the novel The Big House and the short story collection The Sheep Breeders Dance. In addition, she has written several award-winning short stories and numerous feature articles for the Irish Independent, the Irish Voice, Creative Nonfiction, and the Literary Review, among others. Her latest short stories, La Belle Femme, and Snow, are available as e-shorts on Amazon, from Pixel Hall Press. The Girl in the Photograph, I love it! "Anyush" by Martine Madden. Review and Giveaway. "Hunting Shadows" by Sheila Bugler. Review. 'Black Lake' by Johanna Lane. Review. "City of Dis" by David Butler. GIveaway. "The Boxer's Dreams of Love" by Philip Boyle. "Tyringham Park" by Rosemary McLoughan. Review.